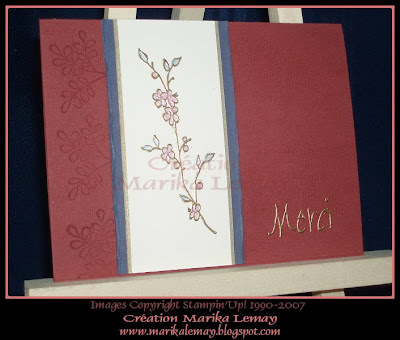 I'm just doing a quickie post to share a lovely card that was emailed to me from this week's guest artist: Marika Lemay! Marika is a French-Canadian demonstrator who lives in Crabtree, Quebec. She's a FABULOUS stamper and a really, really nice lady too. She's in my 3rd level of downline and I'm truly blessed to have her as part of the "Canadians, INK!" team! Here's her pretty card using the "Artfully Asian" set. Let's give it up for Marika -- merci bien! Oooooh, love it! So pretty, and so simple! !